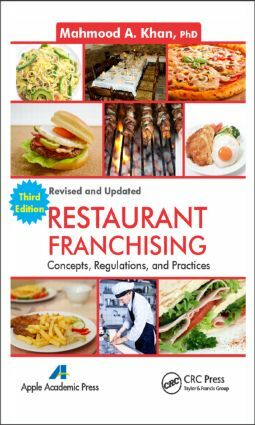 This book is the only up-to-date book of its kind that will provide an introduction to franchising, its pros and cons, and other aspects pertinent to restaurant franchises. It is the only guide to franchising written exclusively for food service professionals and is an indispensable resource for anyone wishing to break into one of today’s most dynamic service industries. Since the late 1800s, when the idea was first conceived, the restaurant franchise has become a worldwide phenomenon. Opportunities abound for restaurateurs and food service professionals with the know-how to dive into and stay afloat in the growing, ever-changing sea of franchise operations. With the help of vignettes and case histories, this completely updated new edition to Restaurant Franchising explains operate a successful franchise, from developing a winning franchise concept to demystifying the legal intricacies of franchise agreements. This book is suitable for classroom use, and an accompanying online instructor’s manual is available as a teaching resource for instructors. It includes a template of a syllabus to fit one semester within an academic calendar, and each chapter’s contents are highlighted starting with the chapter’s objectives. Objectives are designed so that after reading and studying each chapter, the student should be able to complete specific knowledge components. Key teaching elements and points are listed for each chapter, with special emphasis on definitions and terminology. References and other sources for further information are also provided. At the end of each chapter within this book, there is a case study, for which discussion questions are listed. Possible topics for class assignments and field studies are suggested in the instructor’s manual. In addition, almost 200 PowerPoint slides are provided for each chapter. Overall this manual is designed to provide teaching aids that will help in making lectures a more productive, interactive, and interesting learning experience for students. "The newly revised third edition is a classic book covering one of the most vibrant and vital sectors of the US economy. . . . The book is an excellent introduction, much more than a general academic treatment of the topic. . . . On behalf of the International Franchise Association, we are grateful to Dr. Khan for revising and bringing out a new edition of this classic book. It is a multi-purpose book, serving as classroom textbook, reference book, and business guidebook. We are delighted to recommend it on the menu for anyone who wants to learn more about this fascinating, fast-paced, and dynamic industry." "The revised and updated third edition of Restaurant Franchising truly delivers on its promise to introduce potential restaurateurs looking to purchase a franchise the benefits as well as the challenges of operating as a franchisee. Similarly, it provides the necessary recommendations and caveats to operators looking to franchise their concept. One of the book’s best features is the current examples that underscore the key points so nicely. It is also refreshing to find a book that has utility in the classroom and in the industry." Dr. Mahmood A. Khan is professor of hospitality and tourism management at the Pamplin College of Business at Virginia Polytechnic Institute and State University, in Falls Church, Virginia. He founded the university’s hospitality and tourism management program in 1988. He has taught at the University of Illinois at Urbana-Champaign, Albright College (Reading, Pennsylvania), and The Pennsylvania State University. Dr. Khan received his PhD from Louisiana State University. He has received many awards and honors for his work and was also given the key to the city of Baton Rouge, Louisiana, by the mayor-president. He has served as an advisory board member for many programs and has served as a consultant to several university and college programs and many prominent restaurants, hotels, and other food service and hospitality businesses. In addition to having authored several books, Dr. Khan has been editor-in-chief of several journals, has written articles and book chapters, and has presented at many international conferences.